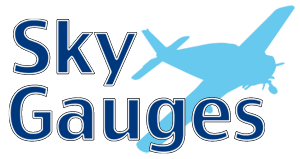 There are a few things you should know about SkyGauges; this page provides links to quick overviews to get you up to speed. Click the topic to review more information about it. FAQs are located below the help topics. Compass mode - True North, Magnetic North, Course. Q: My compass sometimes acts wacky, what should I do? A: The compass in SkyGauges (in True North or Magnetic North mode) will always show what the Apple application "Compass" shows, except it can be modified with a variation angle. The variation angle is meant to offset your mounting angles, however, when the phone is in a a near vertical position it can have trouble finding the correct direction. The phone's location services use the top of the phone to determine the compass direction, so if it points straight up you can see how it would have problems. This is why I've added the "Course" option for the compass. This uses your movement to determine what direction are going! This means that it doesn't matter what orientation the phone is in, it will always report the correct direction, but you DO need to be moving for it to get an accurate direction. Long story short, switch to Course mode and when you are moving your compass will report the correct direction!